Overcoming widespread beliefs that American millennials have no wish to be politically engaged, the Northeastern University (NU) Student Government Association (SGA) and 16 other campus organizations have launched a nonpartisan effort called Northeastern Votes. The movement, which started just before the first day of fall classes, is focused on democratic participation and voter registration. SGA President Elliot Horen, a junior pursuing a combined major in information science and business, is one of the masterminds behind the coalition. “Millennials in general don’t participate in elections, which kind of feeds our future to an older generation,” Horen said. Less than half of all 18-to-24-year-olds in the 2012 presidential election voted, according to the Pew Research Center. Horen said that Northeastern Votes started with a goal of “80 by 20” – registering 80 percent of the students on campus to vote by 2020. The organization started a website using the application TurboVote, which allows it to track the number of people registering online and signing up for election updates. 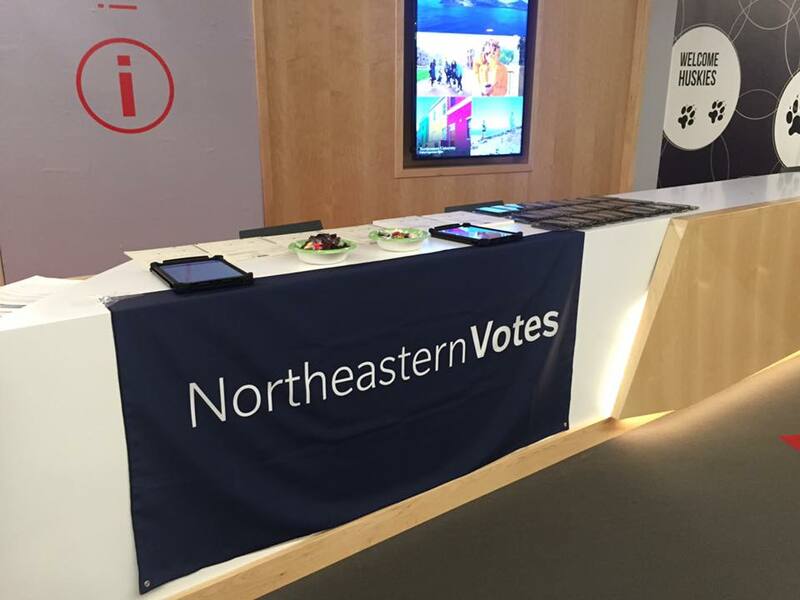 Northeastern Votes is reaching students largely through tabling and social media campaigns. In addition to SGA and 16 other campus organizations, Northeastern Votes is partnered with six university offices. For example, NU Dining is hosting giveaways and decorating cupcakes with politically-themed icing, the Office of Community Service and Affairs is sponsoring a debate-watching party Monday in Blackman Auditorium and the Office of Academic and Student Affairs is contributing money to sponsor the election watch party on election night in November. Generation Citizen Northeastern, a student club that aims to educate, engage and inspire Boston’s youth through civics, is one of the organizations that forms the coalition. Jeffrey Curran, a senior physics major and the chapter executive director of Generation Citizen Northeastern, believes Northeastern Votes aligns closely with the civics-based goals of his organizations. For Curran, being an active citizen begins with a simple but crucial action: Voting. Kayla O’Neill, a senior business and international affairs major, is the co-vice president of community and social impact for the Northeastern University Marketing Association (NUMA). NUMA is another organization behind Northeastern Votes. #WhyIVote has been based largely on the Northeastern Votes Facebook page. There, photos of Northeastern students’ faces dot the feed, each overlaid by a #WhyIVote filter and accompanied by a quote from the photographed student. According to the Pew Research Center, the turnout rate among 18-to-24-year olds fell from 48.5 percent in 2008 to to 41.2 percent in 2012. For O’Neill, Northeastern Votes provided an opportunity to change that graph’s direction. Fourth-year chemical engineering major Quincy Cundiff-Kopplin was glad to be afforded the opportunity to volunteer by tabling for Northeastern Votes on campus. One of those people who approached the table was Caitlyn Valerio. A third-year pharmacy major, she believed in the importance of civic engagement for young voters. Jerome McKeever, a third-year marketing and finance major, agreed with Valerio’s sentiment. He said the booth was an active component in his registration. Students like McKeever are exactly the type of people Northeastern Votes aims to reach. For Horen, engagement is all the initiative could hope to accomplish. The 16 campus organizations partnered with SGA are: North­eastern Uni­ver­sity Mar­keting Asso­ci­a­tion; Gen­er­a­tion Cit­izen; Res­i­dent Stu­dent Asso­ci­a­tion; Inter­fra­ter­nity Council; Panhellenic Council; Acting Out; North­eastern Col­lege Repub­li­cans; North­eastern Col­lege Democ­rats; North­eastern Polit­ical Review; Polit­ical Sci­ence and Inter­na­tional Affairs Stu­dent Asso­ci­a­tion; North­eastern Sexual Health Advo­cacy, Resources, and Edu­ca­tion; Stu­dent Alumni Asso­ci­a­tion; National Res­i­dence Hall Hon­orary; Delta Tau Delta; Sigma Phi Epsilon; and Delta Phi Epsilon. Current editor-in-chief of The Huntington News Sam Haas was on the Generation Citizen Northeastern executive board between January 2015 and April 2016. Jasmine Wu contributed to this report. Photo courtesy of Northeastern SGA. Correction: A previous version of this article referred to Elliot Horen as a senior.